Have some industry events reached their stagnation point? As our research has emphatically revealed, peer networking is the preferred medium of choice for today's outsourcing decision makers. So when executives are putting considerable time, cost and effort into spending multiple days at these gatherings, they hope to get some serious value out of the networking and education. After attending the 2011 and 2012 World Summits hosted by the International Association of Outsourcing Professionals (IAOP), we were left with a feeling that event organizers were ignoring the opportunity to assemble top-notch thought leadership to drive community discussion. While keynotes were remarkably better than 2011, the educational sessions seemed similar to discussions had at every other event and last year’s 2011 World Summit. Presenters share a background on their company, their journey to success, challenges overcome, and lessons learned. Service providers stand beside their clients as their clients endorse the service provider’s services. Panelists who are CEOs for different service providers argue for the viability of regions, niche categories of services, and the need for better contract terms. 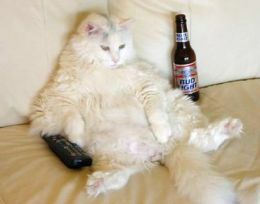 Time to change that channel? The formula for events has become rote. Lectures and panel discussions are the dominant format, which drives little communication among attendees. Sessions rarely focus on the need for our industry to change and instead focus on repeating what has already happened or promoting sponsor interests. In lieu of tools and templates, presenters provide business cards and collateral. There is an exhibition hall full of booths staffed by marketing leaders handing out tchotchkes. Sales people meet between sessions to assemble lists of leads. IAOP events, in particular, create the impression that the event is formulaic. Awards are given to individuals and companies. Many of the same people moderate or lead IAOP sessions each year. New lists of top service providers and advisors are announced. In fact, for the second year in a row, these “top” lists exclude the likes of industry leaders Cognizant, IBM and Xerox. Billed as "The Largest of its Kind"
Over 780 “delegates” attended the IAOP 2012 World Summit held in Orlando, Florida. Roughly one third of delegates were customers or buyers, one third of delegates were service providers, and the last third were a mix of advisors, regional governmental representatives, academics, and press. The event spanned roughly two and half days, which were divided into the following types of content. » Main session presentations where keynote presentations were given to all delegates. These made up roughly eight hours of the World Summit. Three of those hours were held at the same time as other content. » Seven “educational” tracks where companies presented theory and experiences. These tracks focused on customer experience, outsourcing tools, “management science”, transition and governance, the “human side” of outsourcing, globalization, and the future of outsourcing. There were six 50-minute presentations in each track, which totaled nearly six hours of content. » Networking events where customers were sometimes separated from service providers and advisors. Besides structured “speed dating” networking where participants moved from table to table discussing different topics (about two hours), there were evening mixers sponsored by service providers who gave away prizes to participants. » Practicums were held on the morning of the last day where buyers and service providers were separated. Three hours of presentations were given to each group. Buyers heard ITSqc promote its CMI-like capability maturity model and presentations from P&G and McGraw-Hill on metrics. Service providers heard the findings from Duke’s 2011 outsourcing study, ITSqc’s promotion of its capability maturity model, and a sales effectiveness presentation from Pretium Partners. In addition, several service providers sponsored dinners or drinks in the evenings. There was also a large hall filled with service providers’ marketing booths. The IAOP also rolled-out the “Summit Hub”, an online portal for attendees to read detailed session descriptions, plan their schedule, and proactively network with other attendees. In fact, the IAOP allowed all participants to update personal profiles and “request” meetings with other participants online. For the most part, IAOP puts on well-organized events with high attendance of a broad cross-section of industry stakeholders. Expect crowds full of buyers, sales people, and industry influencers. If you are a newcomer to outsourcing, a World Summit is an ideal event because it hosts sessions on nearly every conceivable topic, from contract metrics to outsourcing in China and from contracting for cloud technology to health care services. World Summits are a smorgasbord of outsourcing discussion. You’ll have an opportunity to listen to topics on subjects you may have never otherwise have considered. However, discussion is rarely more than a high-level summary. You’ll need to follow-up with presenters after the event to get the detailed information you need to execute. Because of the breadth of discussion, there are great networking opportunities. You’ll meet a large number of new people if you introduce yourself to your neighbors in each session, during meals, and take advantage of the structured networking activities. Most attendees find this the biggest benefit of the event. Yet, the busy schedule and predominately lecture-style formats of sessions limit your ability to interact with attendees. See our suggestions below for advice on how to improve your networking activities. The awards given at the World Summit communicates clearly that the industry is a community and that some industry participants are great examples of outsourcing relationships and skills. To those who are new or have suboptimal relationships, the awards can serve as an aspiration. To those with experience, the awards can remind them that they haven’t yet achieved all that they could. To those who win, awards are a wonderful recognition of hard work and industry contribution. More importantly, the community that assembles is full of people who achieved the same results, but cannot seek out recognition because their organizations do not want public recognition of their outsourcing prowness. The problem with events as an information source is that event companies don’t vet the content that is presented for quality. Despite “calls for paper” requests and committees that are supposed to vet the proposed content, speakers are selected based on marketing spend instead of quality of content. 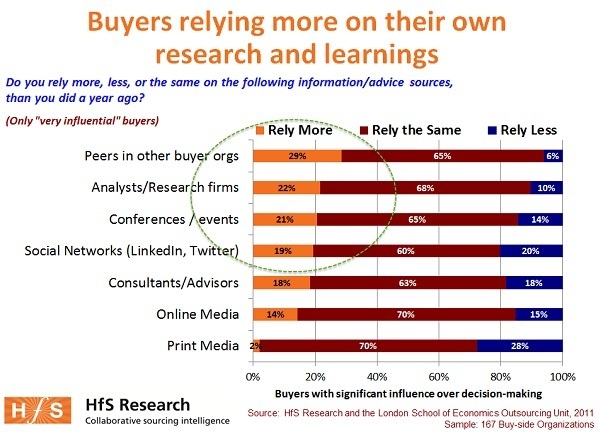 As shown in Exhibit 1, those influential buyers with significant influence over outsourcing decisions know the game and they find event content far less compelling than other sources. This is the gist of the main criticism of the IAOP World Summit: The World Summit focuses too much on marketing and connecting sales people with buyers, and less on creating meaningful forward-looking momentum for the industry. World Summits are trade shows, not thought leadership venues. And they lack enough networking opportunities to build strong communities. » Break with the old, bring in the new. Don’t rehash the same discussions with the same presenters and moderators in 2013. Require speakers to up the ante and bring fresh content. Vet the content for quality so that panel discussions and sessions presenters don’t come-off as marketing shills. Encourage sessions that drive participants to interact, so they come away with new ideas and better relationships. » Use a venue of the right size or limit attendee numbers. The organizers of the World Summit chose rooms that were too small on several occasions with major negative consequences. For example, the Tuesday lunch had insufficient seating capacity forcing people who paid $1,000 or more to attend the event to go to the cafeteria to eat and miss the keynote given at the same time. The breakout session rooms were almost always too small (or we attended the most popular discussions!). At times there wasn’t even room to stand in the back. Organizers need to do a better job of picking the right size venues or allowing people to pre-register for breakout sessions. » Shameless freebie giveaways devalue the perception of the event. At a number of sponsored sessions, service providers heavily promoted giveaways of wine, Kindles, portable projectors, and other gifts. While swag is great, its gives off an appearance of street hawkers trying to promote their services, not contribute to the industry’s knowledge. Organizations don’t select service providers or advisors based on the quality or quantity of wine they handout. » Let people network and stop threatening them when they do. During the Wednesday lunch and afternoon networking session, one speaker took to the microphone and ordered the entire audience to stop talking amongst themselves and instead listen to the droll introduction of chapters (he should have considered the poor quality of content, which was why the crowd ignored him). On at least three occasions, the same speaker threatened to embarrass people who weren’t silently listening to the hard to hear discussion. The speaker, a CEO of an advisory firm, accomplished only one thing: lessening the likelihood of people hiring him. The event organizers could have done a better job allowing time for people to network on their own or providing compelling content. » Increase the quality of content. Buyers sharing experiences and best practices gave only one third of the presentations. This is always the top area of interest to buyers, and more space in the agenda should be allocated to this. However, improving the quantity of high interest is not enough. Event organizers need to improve the quality of breakout session presentations. Some sessions were outstanding, but some sessions were lead by presenters who were not as well prepared and whose slides were too high level to address the level of interest and insight participants seek. Kudos should go to Accenture who used a graphics artist that drew pictures as presenters spoke. It was a fun way of keeping the audience’s attention and stood out among the throng of text heavy PowerPoint presentations that dominated the event. » Increase interaction among attendees. While the Summit Hub was an interesting social media experiment, it wasn’t actively used during the event. Evening mixers were sparsely attended. Presentations were generally given in lecture format. More can be done to generate interaction and create new relationships among attendees. » Consider smaller focused events because big events lose focus. Just as buffet-style restaurants lose quality by trying to be everything to everyone, a World Summit can seem overwhelming in the sheer diversity of discussions. Most buyers and service providers have great interest in niches of services and there will undoubtedly be a session or two that meets attendee’s interest. However, the lack of event focus limits the number of sessions that will appeal to attendees. Smaller, themed events can improve the focus and allow attendees of similar interests to network better. » Network in advance. The problem with an event like this is that everyone you’d likely want to meet is busy scheduling time with people with whom they’d like to talk. Given the sheer size of the event, participants find it hard to serendipitously run into individuals they want to speak with. IAOP’s Summit Hub makes it even harder to find these people because participants felt inundated with requests from individuals they had never heard of – especially individuals who gave their marketing teams access and used the Summit Hub as a lead generation tool. If you want to talk to someone of interest, reach out to presenters and participants in advance of the summit and ask to speak with them. Use the Summit Hub, but also reach out to them using LinkedIn or through colleagues. A particular challenge will be to find time to meet given the busy event schedule. You simply wont have a lot of available time for a meaningful conversation. So, use your meal times as opportunities to meet and greet, as well as offer to meet at mixers or other organized social events. » Give yourself time for unexpected connections. You will meet a variety of people you hadn’t anticipated to meet. Don’t book yourself solid with event presentations and offline networking discussions. Leave yourself time to meet people and start or continue new conversations. Don’t be shy about meeting people – everyone is there to meet others. Most importantly, don’t spend the time you have with others telling them about you. Instead, ask questions and build a relationship that will allow for a follow-up discussion after the event ends. » Avoid repeat presentations and veiled sales pitches. If you have previously attended a World Summit, skip the sessions given by the same presenters. There were several presenters who repeated highly similar content presented at the 2011 World Summit. A few sessions were nothing more than thinly veiled sales presentations focused on a portion of a service providers’ capabilities. These discussions do not provide meaningful content that you’ll easily be able to take back to your company. You’re better off to call these companies directly and schedule time to meet with them outside of the conference. Buyers and researchers lead the best presentations, as they generate discussion full of useful information. » Select panel discussions carefully. One of the great things about the World Summit are panel discussions where three or more experts are supposed to be selected to discuss a particular topic. It theoretically offers an excellent opportunity to hear multiple perspectives on the same topic. However, panel discussions are notoriously poorly prepared and low on content. Panelists usually meet once beforehand to review questions and “coordinate” responses. Attendees hear little more than opinionated soundbytes with little tangible content. Attending a panel discussion should be left for newcomers to the content where the variety of small sound bytes provide introductory content. More interestingly, fellow attendees often have greater expertise than the panelists and are a great source of the same information. So, arrive early and introduce yourself to your neighbors. Alternatively, bring a perplexing issue to the moderator’s attention and request the opportunity to ask the panelists their opinions. » Manage your business cards. You’ll have a stack of business cards at the end of the event, but you’ll have a hard time matching faces with names. Be sure to write down action items on the back of every card you receive so you don’t forget. When you get back to your office the following week, block out two hours to follow-up with every person you met. This process will make sure you leverage the event for long term networking relationships, not just the content presented in the sessions. » Meet new talent you can hire. All organizations can improve their talent, and events offer excellent opportunities to network with practitioners at other companies. Use networking opportunities to identify talent your organization can use. Events are important opportunities to improve attendee general knowledge of industry trends and build broader peer networks. IAOP World Summits achieve that objective and are ideal events for industry newcomers looking to improve their knowledge and networks. World Summits are also ideal opportunities for experienced industry veterans to take a break amidst their busy global responsibility to reflect on their achievements and opportunities to improve. If you prepare properly and apply some basic principles, these well-organized events are goldmines of opportunity. However, the repetitive format of the event, the too-common lecture-style format of sessions, and repeat topics can lead many attendees to feel a bit like a character in Groundhog Day if they attend year after year. The lack of event focus on any one theme assures attendees that they’ll hear a little about everything and not enough about their specific areas of focus. Heavy marketing and overt sponsorship may be a sign of the times, but limits serious dialogue on industry challenges. In fact, the combination of a jam-packed agenda and lecture-style sessions limits networking opportunities to brief windows between sessions. Because the repetitive nature of events, event goers are probably better off broadening their industry knowledge by alternating between IAOP and SSON events, or even seek out more focused process or industry events, like ProcureCon, SIG, and AHIP or regional events held in Latin America, Europe, or Asia. Thanks for the great commentary on the event. I first of all wish to recognize IAOP for being one of the first in the space and seizing the opportunity to make a mark. With that said the observations made are not unique to their conference but quite characteristic to outsourcing conferences in general. These are clearly an agenda and commercial driven event. There are even events where speakers are only taken from sponsors, in other cases they are drawn from the firms on employees (wonder how much unbiased info you get there). The numbers are quite reflective of the economic times and possibly location (although Orlando is not a bad venue and price points are great from an organizers perspective). I applaud you for putting this together - am sure many of us share your feelings on this issue. If these events want to charge buyers large fees to attend, they need to do more than put paid-for vendor presentations in front of them. As you point out, if they want a sales pitch, they can arrange these in their own time. However, I do not expect things to change as long as the events firms are making pots of cash out of this model. You can't blame these events associations for milking the sponsorship dollars from the suppliers. If people want to throw them money and turn up, that's good business for them. However, whether those buyers who spent $1,900 on tickets got enough value to come back again next year is the REAL issue here. I think the core issue here is that the outsourcing events industry is so dependent on the vendor marketing dollars to function. There is no way these events organizations could survive purely on delegate moneys from buyers - and the IAOP is not the only association here that has to take considerable vendor sponsorship dollars to fund events at this scale. In addition, there is such a disparity of experience at these shows - the complete novices and juniors through to the more experienced and senior buyers, making it very hard to satisfy all parties. You referenced other industry events. What is AHIP? @Deborah - I think everyone would love a TED-like approach. Short presentations from leaders of all walks of life drives great discussion, face-to-face and online social networking, interaction among the participants, etc. The IAOP puts on a broadly focused events across industries and processes. While its interesting to hit a dozen different topics related to outsourcing, most industry participants are verticalized - insurance, healthcare, banking, manufacturing - or process focused - finance, procurement, sales. A person who runs finance outsourcing for a manufacturer is likely to find just a couple of interesting topics directly related to his or her job. They will also get exposure to issues they may otherwise not have considered. For example, Accenture seriously improved the visibility to corporate responsibility issues at the 2012 event - its a discussion you wouldn't have heard elsewhere (except a CSR event). However, my suggestion is to alternate between the IAOP/SSON events (depending on your organization's outsourcing vs. shared service strategy) and a few things more closely focused on your actual business with a vertical option and a functional option. E.g., Imagine a healthcare outsourcing governance professional with responsibility for source to pay rolling through IAOP, AHIP's Institute 2012, and ProcureCon. In this way, even if events repeat the same formula, time has passed to allow further maturity in your areas of interest. And each event has their pluses and minuses. IAOP offers awards that can inspire, but ProcureCon offers an entire day of buyer-only discussions and roundtables which participants love. Mix it up a bit for improved networking and educational opportunities. Thank you for sharing such a thoughtful and balanced view of this event - it's refreshing to have someone talk about the good WITH the bad. I especially appreciate the advice you give to buyers on how to make the most of from the experience. All the focus with these shows is about how vendors can maximize their marketing dollars, but who is looking out for the executives who have to go through all the internal processes to justify the expense of attending these shows to their bosses? Very good post. You can never avoid the excessive or (as you put it) shameless marketing at these events, but the events management CAN improve their content. The problem with boring, repetitive content is particularly bad in the outsourcing space - if these outsourcing events firms cannot improve their level of education and quality, people will stop coming to them and we'll end up with suppliers marketing to each other. Thanks for sharing your views here, they are right on. IAOP is not the only culprit, but if I have to sit through another week listening to second rate consultants telling me how they can "transform" my business as they pick up some "award", I think I may shoot myself. I enjoyed your article, but do not believe IAOP is the worst offender: they have a strong focus on outsourcing and get good attendance at their summits. This was an excellent blog which I really enjoyed reading. I wish more people would report on events like this, so we know what to expect and how to prepare in advance. Vendors and consultants will sponsor events where they can get in front of their prospective customers, so the events organizers need to focus on the CUSTOMERS to make sure they are going to get maximum value and return again. Too many events companies have become so focused on their sponsor's needs they are allowing them to dictate the content. I would second Paul's comment here about boring, repetitive content. If people hear the same speakers, the same content two, three, four years in a row, they aren't going to keep coming back for more, are they? Outsourcing events like this need a complete overhaul. I'd like to know who came back from this one having learned anything new. Thanks for attending The 2012 Outsourcing World Summit and for taking the time to share in such detail your impressions and recommendations. Thank you also to everyone who has added their input through this discussion. IAOP is very proud of the role it plays in advancing the industry and profession of outsourcing. Candid feedback - both good and bad - always helps us continue to improve our programs for members and non-members, alike. It is worth noting that in our recently completed survey of 2012 Summit delegates, 97% of them rated The Outsourcing World Summit "good" to "excellent" when compared to other outsourcing programs they've attended in the past. Then I guess you can get away with another year of the same winning formula as the past five. Why change when you're making money? I agree with Kim, all feedback is useful, especially the survey results shared of actual attendees. The real issue with a blog like this is you have too few people originating constructive feedback and way too many others simply critiquing what is wrong- with no idea how to make it better. Just curious, who does it better than IAOP, and why? First, thanks for participating in the conversation, whether you agree or disagree. Second, remember this is the number one visited site in the entire industry. There may be event companies, service providers, and other content available online, but nothing is read more than this blog. No one censors the comments (except where necessary to keep the place civil) and you're free to express your opinion. There is no advertising here, no page full of logos cluttering our pages suggesting marketing relationships. Behind this blog is a real company, the #1 ranked analyst firm in the outsourcing industry headed by the #1 analyst. We work hard to uncover that data and trends which are new. Yet, we fervently believe in the concept behind our name, "different horses for different courses." If you have an opinion on why one event is better than another, share you opinion. If you like the repetitive nature of events, leave a comment. If you think that someone does it better than the IAOP, SSOW, etc, let me know. I'd love to hear your opinion. Finally, far too many people have read the title and not digested the content. I certainly didn't say anything to contradict's Kim's point - there are real fans of every event (you should have seen the email!). Yet, regardless of venue, for how many more years do we have to trot out the old outsourcing warhorses to talk about the days of yesteryear? Event organizers should bring thought leadership to the table that breaks new ground, instead of, "Company XYZ outsourced process ABC to service provider 123 and see the success they had!" Organizations should focus on process leadership: How great organizations excel at finance, procurement, customer service, and IT, rather than how they "excel" at outsourcing it. The former is far less repetitive, more inspirational, and creates better outcomes. It allows service providers and customers to engage in a dialogue on how they can work together to improve outcomes. Thank you for hearing us Tony! I love IAOP, but that is because I think I grew into outsourcing with it. Today, I am not the same naïve/virgin person I was many years ago, but now a seasoned outsourcing professional. What I have always said is that IAOP is great for someone new in the outsourcing world, but is not such an effective vehicle as you and your company mature into the next phase. I have, for a long time, been trying to find the correct fit of a group that can help me get to that next "level" of outsourcing. While I have found a few that almost nail it, HFS, SSON, and SIG, I am still looking for a seasoned and highly-experienced outsourcer group. One that is not solely for those in the first 3 years of a contract or even a second one, but one that truly serves those in the outsourcing role for over 10ish years. I am looking to meet people who are experts in governance strategy and governance tools, who can share their experienced past failures and lessons-learned with me and vice-versa. I believe the best tool that I have in my belt (not to stroke yall) is HFS and that is because it embraces the needs of senior peers, and I hope it still evolves even more. Tony - thanks again from writing this and look forward to seeing you in the HFS50 later this month.